Students of elementary, intermediate, and high schools are invited to read their original poetry at the Reading Room on Thursday, April 30 as part of Poem in Your Pocket Day. This event marks the traditional beginning of the Reading Room Word for Word summer season. If you are 18 or under, and a student at a NYC school, you may register for our Poem In Your Pocket Open Mic. Please email nng@urbanmgt.com if you are interested in participating. 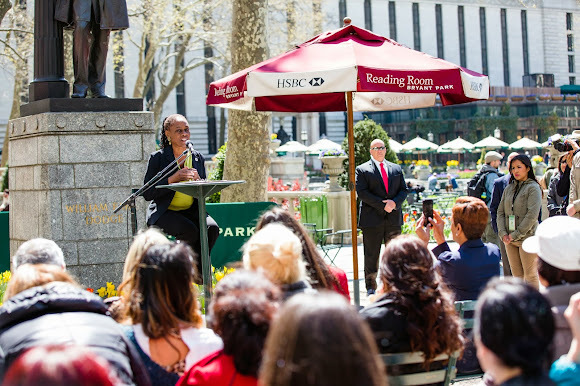 First Lady Chirlane McCray was the guest of honor at Poem in your Pocket Day 2014. Produced in cooperation with the New York Department of Cultural Affairs, the Department of Education, NYC Votes, UrbanWordNYC, and the Office of the Mayor.